Shayetet-13 Naval Commando catches ship carrying B-302 missiles that came from Syria, through Iran. Photo taken aboard the ship. The IDF's elite Shayetet-13 naval commando raided a ship off the shores of Sudan before dawn Wednesday. The ship, which flew a Panamanian flag, carried dozens of B-302 missiles that have a range of up to 200 kilometers. The raid took place in the Red Sea, between the waters of Sudan and Eritrea. According to initial information, the shipment originated in Syria. The missiles were then taken aboard planes to Iran, and then made their way on the ship to Sudan. The missiles were hidden with sacks of cement. The IDF Spokesman's Unit said that it knows with certainty that Iran is behind the shipment. The IDF soldiers are all safe and they are currently guiding the ship toward Eilat. The IDF Chief of Staff, Lt. Gen. Benny Gantz, supervised the raid alongside Navy Commander, Maj. Gen. Ram Rotberg. The IDF noted that the ship's captain tried to fool the IDF by first navigating toward Iraq, and only then toward Sudan. 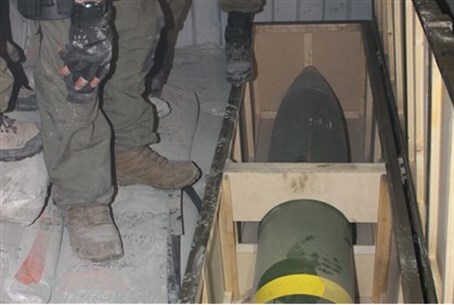 The missiles were headed to terror organizations in Gaza, said the IDF. They were to be offloaded in Sudan and then smuggled to Gaza through the Sinai. The ship is named Klos C. It had an international crew of 17, who are now being interrogated. "The operation was made possible by high-quality inter-community intelligence and high operative capabilities of the IDF,” said the Spokesman, in what appears to be a reference to cooperation with non-Israeli intelligence communities. The operation was authorized by the political echelon, once conditions had ripened for its execution. "The IDF will continue to take action against the regional arms race that Iran is leading in order to set fire to the region, and will use all of the capabilities it possesses to secure the safety of the citizens of Israel,” the Spokesman added.